Adventure, Ayurveda, Beaches, Culture, Great Hotels, Hill country, Nature, Tea, Scenery, Spa, Service, Underwater, Villages ........... there are an infinite number of reasons for exploring Sri Lanka. In this publication, we hope to introduce you to just one of a million facets of this magical island. 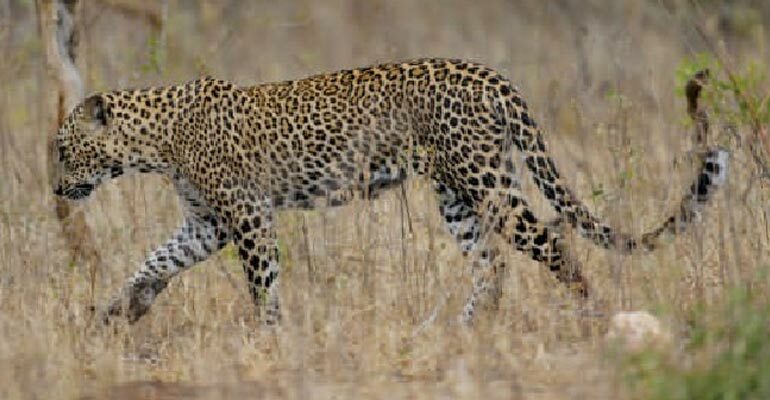 Is it true that Sri Lanka is the best chance in the world for seeing leopard? Some think so. It is certainly safe to say it is one of the best places in the world and is your best chance in Asia. Why is Sri Lanka so good? 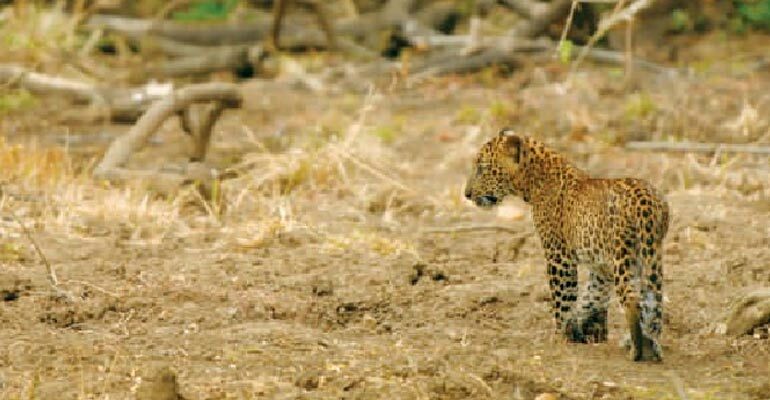 Sri Lanka's reputation for leopards goes back several decades, thanks to the leopard populations in the national parks of Ruhunu and Wilpattu. Ruhunu National Park is popularly referred to as Yala or at times Yala National Park. The leopards of Yala (or more specifically those in Block 1 of the national park) have been studied using photographic identification. The data shows that the average density can be as high as one leopard per one square kilometer. This is one of the key factors for Yala being so good for leopards. Another factor is the open terrain of the park with the scrub jungle interspersed with grassland. The grasslands and numerous freshwater lakes, all the result of human activities in the ancient past, result in a high density of spotted deer. The deer is the main prey of the leopard and its abundant presence contributes to a high population of the predator. Leopards are also the top terrestrial predator. They do not have to contend with tigers as in India or hyenas and lions as in Africa. 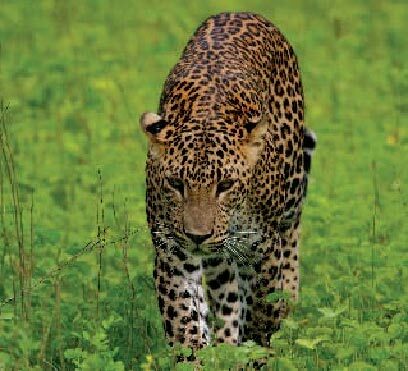 Therefore the Sri Lankan leopard has an air of authority and confidence in showing itself during the day. This is especially true of the young leopards, who may still be in mum's care. Leopards are remarkably relaxed (top) in Sri Lanka. The absence of a larger terrestrial predator means even very young cubs (facing page) are frequently encountered on a walk about on their own. Is there a particular time of year which is better than others? Not really. Leopard sightings are good all year round. In Sri Lanka, leopards give birth to cubs throughout the year. At any given time there is a good mix of cubs and sub-adults (it is mainly the young leopards who show themselves during daylight hours). However, avoid the period from 1 September to 15 October. 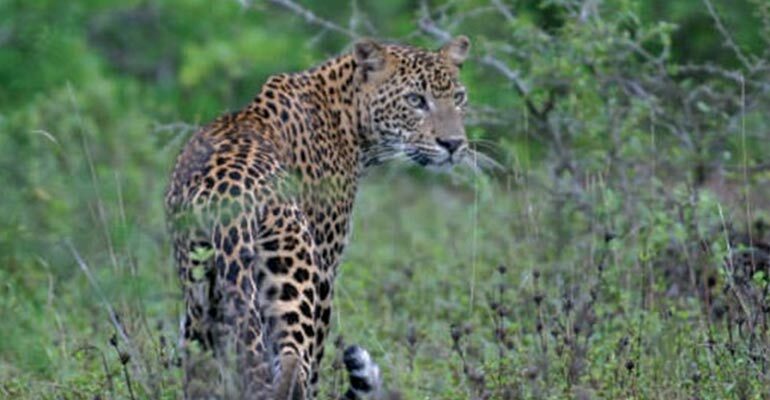 Ruhunu (Yala) National Park, the best park for leopards, may be closed for a part or during the whole of this six week period. Around July and August the undergrowth in the dry zone has seasonally died back. This can at times result in better opportunities for photographing leopards. Patient vigils at waterholes are also more likely to be rewarded with a variety of mammals. What are my chances of seeing one? As with all animals nothing is guaranteed. However, if you take five game drives, there is a ninety per cent chance of seeing a leopard. 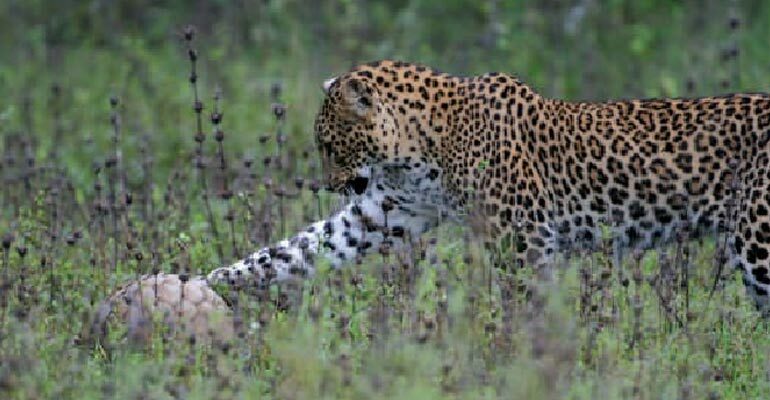 You will improve your chances if you take a tailored leopard safari with a specialist operator who has skilled naturalist guides. What else will I see on a Leopard Safari? National parks such as Yala are very good for seeing mammals. Elephant, sloth bear, jackal, black-naped hare, ruddy mongoose, stripe-necked mongoose, water buffalo, hanuman langur, toque monkey, giant squirrel, palm squirrel, wild pig, sambar and spotted deer are some of the mammals you may see on game drives. Night drives are not allowed inside national parks. But outside national parks, on the way back to your lodge after dark may yield sightings of rusty-spotted cat, ring-tailed civet, common palm civet, gerbil, etc. During the northern winter, over a hundred species of birds may be seen during the day together with a host of other colourful animals such as butterflies and dragonflies. The changing vegetation provide a range of back drops and opportunities throughout the year for photographing and viewing leopards in Sri Lanka. Cats and other nocturnal animals have also evolved a special mechanism for night vision. Behind the retina is a membrane called the tapetum lucidum. This reflect light back through the retina, increasing the sensitivity during low light. This is what causes the eyes of nocturnal animals to glow when an artificial light is shone onto them. To see well in both dull light and bright light, cats control the diameter of the pupil using special muscles in the eye. This allows them to increase the pupil's diameter and increase the amount of light captured, at night. Smell plays a small part in hunting by cats but it is a very important tool in communicating with other members of the same species. Cats will scent mark their territories using a combination of methods. The commonest is to spray urine. Another is to use their faeces as a marker. Yet another is by 'scratching', where scent from inter-digital glands is mixed in. 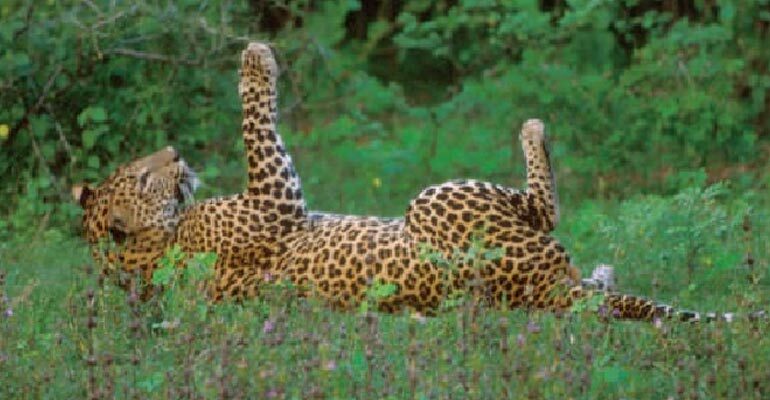 Visitors to Sri Lankan national parks are likely to encounter leopards scent marking at all times of the day. Sri Lanka National Parks and Reserves. 54 pages. ISBN 955-1079-05-1. A fifty four page overview of the key sites for eco-tourism in Sri Lanka with brief details on logistics. 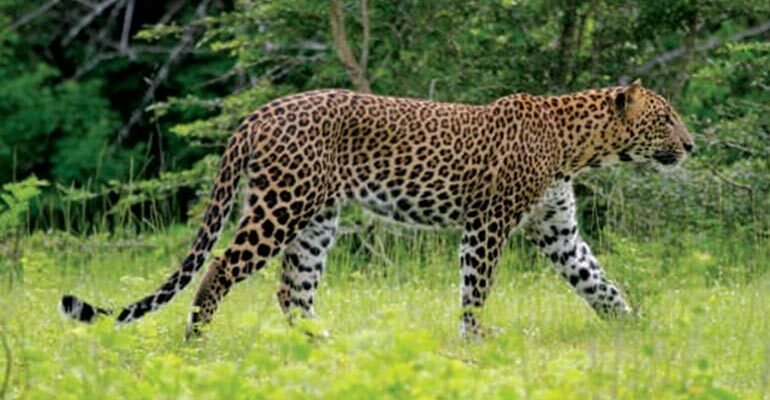 Leopards & other Wildlife of Yala. 232 pages. ISBN 955 - 1079 - 00 - 0. The thirteen contributors cover a variety of topics from Leopards, Elephants, smaller mammals, birds, butterflies and dragonflies to plant life and conservation. Wildlife of the Dry Lowlands. 110 pages of colour plates. ISBN 955-1079-01-9. A photographic guide to the commoner animals and plants of the dry lowlands. Names and introductory text in English, Sinhala, French and German. 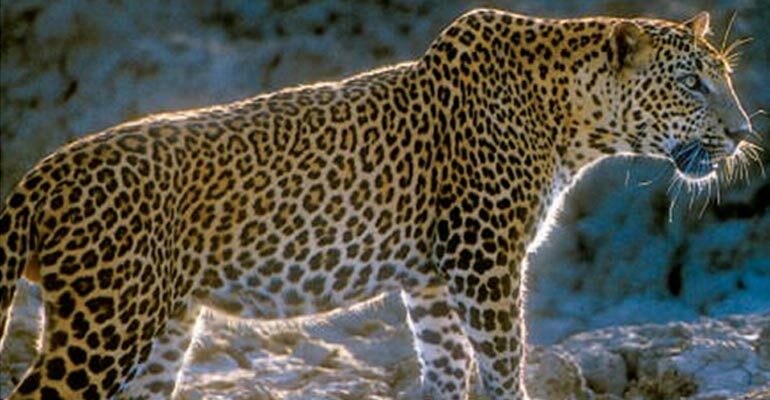 Sri Lanka is the best place in Asia to see and photograph leopards. Research supported by tourism showed that the average density in Yala National Park is as high as one per square kilometer. The lack of other large carnivores means that the leopard is the top predator and adults and cubs are remarkably relaxed during the day, offering great opportunities for viewing and photography. DAY 01 First night in Colombo. Afternoon at leisure or do a city tour of Colombo. Photography in Talangama Wetland. DAY 02 Drive to Yala for four nights. Late afternoon walk on a Nature Trail, which winds through a mixture of habitat types consisting of dry zone scrub forest, lagoon, mud flats, and sand dunes. DAY 03 Morning game drive to Yala National Park. According to the Leopard Research sponsored by one of the leading hotel chains, Yala Block 1 has one of the highest densities of Leopards in the world. 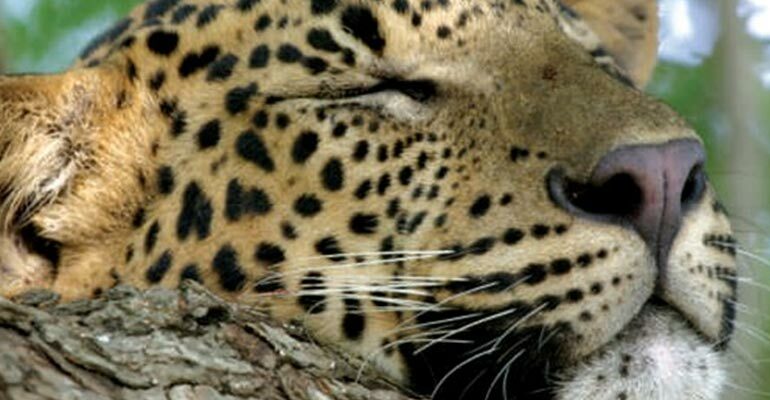 Yala therefore offers the best chance in Asia to see Leopards. Other large animals you may see include Elephant, Sloth Bear, Mugger Crocodile, Spotted Deer, Sambar, Barking Deer, Wild Boar, Wild Buffalo, Jackal, Grey Langur and Ruddy Mongoose. Birding highlights include Malabar Pied Hornbill, Painted Stork, Lesser Adjutant and Black- necked Stork. Return for lunch. Enjoy a dip in the pool / a beach combing walk /siesta before an afternoon game drive to Yala National Park once again. DAY 04 Morning, visit Sithulpahuwa ancient hermitage and the wetlands of Tissamaharama. Late afternoon game drive to Yala National Park for Leopards, Elephants and Sloth Bear. DAY 05 Morning, visit Palatupana Saltpans for migrant shorebirds. Late afternoon game drive to Yala National Park. No. 80 Galle Road, P.O. Box 1504, Galle Road, Colombo 3, Sri Lanka.